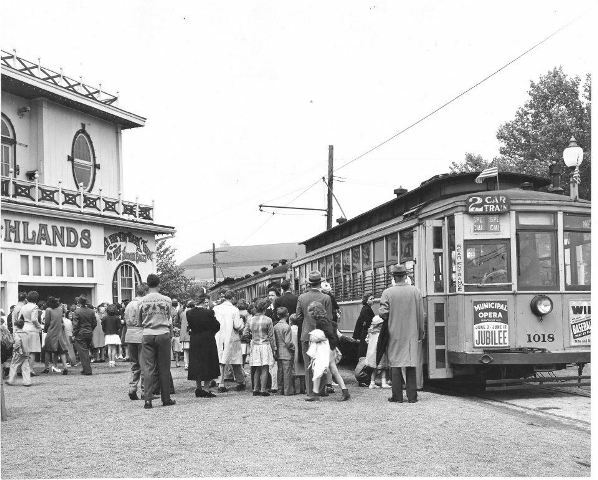 Today’s photo was taken outside of St. Louis’ late great amusement park Forest Park Highlands in 1945. The Old Barn is in the background. The scene is just a stone’s throw from Sunday’s Earth Day festival, happening from 10 a.m. to 6 p.m. at the Muny in Forest Park. The park began in 1896 as a merry-go-round meant to attract customers to the Highlands Cottage restaurant. It expanded over the years and consistently attracted huge crowds until July 19, 1963 when a massive, buzz-killing fire destroyed the park. Amazingly, the original carousel survived and currently resides out in Faust Park. Taking a ride on this carousel continues to be a rite of passage for St. Louis youngsters.